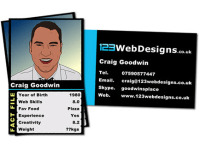 123WebDesigns.co.uk is the on-line presence for Craig Goodwin, a Digital Marketing consultant based in Barry (just down the road from Cardiff) in the Vale of Glamorgan, South Wales. Craig has worked in the Digital Marketing sector for over a decade and with experiences across a wide variety of sectors. Developing quality websites and supporting your digital needs in addition to a full-time roll Craig is able to provide you with an end product that is of high value at a low cost. Visit www.123webdesigns.co.uk for a preview of previous work - please contact me for a chat around your digital requirements and how we can work together to bring your business up to speed online.